Many factors influence the outcome of war. But what has soil got to do with war? 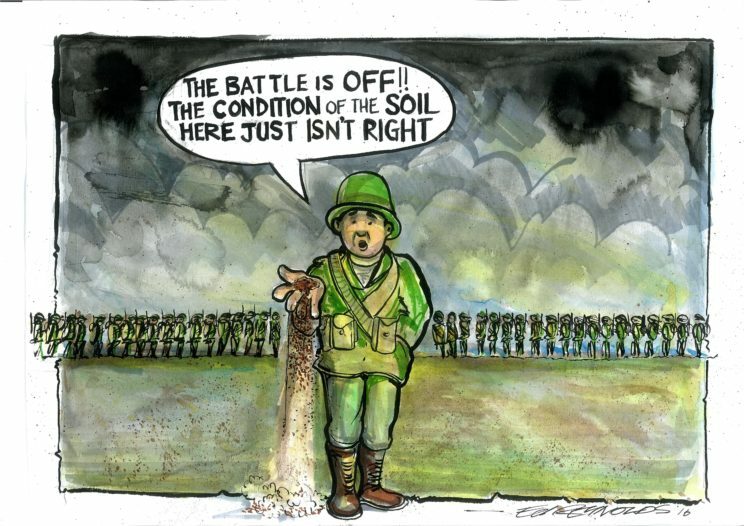 I suspect few have given much thought to the influence of soil on war, or, conversely, how war influences the soil. But the role of soil in warfare can be considerable, as can the impact of war on soil, which can often leave it unusable. The most dramatic and emotive examples of the role of soil in war comes from the First World War, and the battles that occurred along the Western Front. The Battle of Verdun, for example, was fought in 1916 in one of the wettest regions of France on heavy clay soils, which were turned into a sticky quagmire by the prolonged artillery bombardments; this not only hampered attacks, but also it led to many soldiers drowning in the very mud and craters that their own sides created. A similar picture emerged at the Battle of Passchendaele, 1917, commemorated later this year, which took place around Ypres on reclaimed marshland underlain with heavy clay, which became extremely sodden when wet. The battle started with intense bombardment, designed to weaken and demoralize the Germans. But it also served to destroy drains and churn the clayey land into a crater filled quagmire. And as if things couldn’t get worse, the rain began to fall as the Allied infantry attacked, turning the soil into liquid mud. By Ed Reynolds: directly inspired by Soil and War in R. Bardgett’s Earth Matters, and realized in the project Belowground Vision of Life: Soil makes Art, funded by the Leverhulme Trust and hosted by Dr Tancredi Caruso, Queen’s University of Belfast. Used with permission. Soil conditions are also of paramount importance for tunneling, which has been part of warfare for centuries as a means of attacking enemy forces without having to warn or hide from the enemy. Essentially the best soils for tunneling are those that are easy to worked and excavated, but different soils pose different challenges. During the First World War, for example, the heavy clay soils around Ypres were ideally suited to tunneling being plastic and easy to excavate. But the clay expanded when wet, which placed considerable pressure on timber supports, and in some cases made them snap. Another problem was that the underlying geology around Ypres wasn’t uniform, being overlain in places by sediments of sand and silt, which created a complex and unpredictable soil to tunnel. To the south, the underlying geology of the Western Front was chalk, which is soft and porous, and easy to dig. It is also very stable and dry, so tunnels were more self-supporting than at Flanders. But the chalk also created problems. Being very hard, the action of digging couldn’t be done in silence, as could be done in the clays of Flanders; as such, the element of secrecy was difficult to control. On top of this, the spoil from tunnels gleamed brilliant white in sunshine, so it was an obvious target for aerial observers. Another problem was that the water table fluctuated greatly in this region, so tunnels often flooded and surface soils became waterlogged and turned to mud. A key reason why the tunnels of Cu Chi were so effective was the soil. The soils of this area are mostly lateritic clays, which are very deep weathered, rusty red soils that they are very hard, porous. And, unlike the heavy clays of Flanders, they are stable when wet. On top of this, the water table is very deep, allowing tunneling to depth, and extensive root systems of the forest helped to stabilize the tunnels. Put simply, the soils were ideal for tunneling and allowed the Viet Cong to go underground, causing much frustration for the Americans. But as elsewhere, the soil created problems for the Viet Cong, the biggest being how to dispose of masses of soil in a way that it didn’t reveal the presence of tunnels to the Americans. To get around this, the Viet Cong came up with some ingenious ways of soil disposal. Excavated soil was poured into streams and craters left by American B-52 bombing raids, it was used to make furrows for potatoes and banks for combat trenches, and it was secretly transported away from tunnels in crocks, which were small pots used by women to carry fish sauce. As already mentioned, warfare and all its horror can also scar the soil, and the scale of these scars can be astonishing. For example, artillery bombardments of unimaginable scale left soils pulverized during the first World War, and the legacy of this soil obliteration can still be seen today; the use of Agent Orange in Vietnam has left a lingering and deadly fingerprint on the soil, and in some cases soils have been left so toxic that they are unusable; and the nuclear age has left its radioactive signature on soils across the world. Soils have also been contaminated with oil, such as during the Gulf War, and with heavy metals from fragments of shells during the First World War. Given the many and varied ways that warfare can impact soil, and the amount of land that has been, or is, currently affected by war, it could be argued that warfare is one of the most dramatic, but under appreciated ways that humans can affect the soil. Featured image credit: The War The Military Defense by Jarmoluk. Public domain via Pixabay. 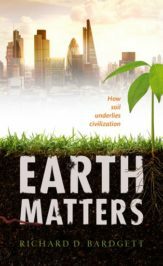 Richard Bardgett is Professor of Ecology at The University of Manchester and author of Earth Matters: How Soil Underlies Civilization (OUP 2016). He has studied soils and their ecology in many parts of the world, from the tropics to the poles, and authored and co-authored several books, including The Biology of Soil (OUP 2005) and Aboveground-Belowground Interactions (OUP 2010).